The Prime Minister, following a recommendation from the Secretary of State for Defence, has approved the appointment of Mr Jon Day as 2nd Permanent Under Secretary (2nd PUS) to the Ministry of Defence, it has been announced today. 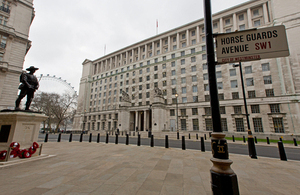 As 2nd PUS, Mr Day will occupy a key role at the centre of the MOD, driving the implementation of the changes resulting from the Strategic Defence and Security Review (SDSR) and the Defence Reform Unit. As one of the two Chief Operating Officers at the MOD (with the Vice Chief of the Defence Staff), Mr Day will be responsible for a range of cross-Departmental business including governance, propriety, safety and business process. He will also be a member of the Executive Committees of all three armed services. Jon Day is a widely respected and highly experienced MOD civil servant who has occupied key policy delivery and change management posts in the Department, worked at senior levels in a number of frontline commands, and has also worked in NATO and the Cabinet Office. I am proud to take up the position of 2nd PUS. This is a crucial time for Defence. I hope that my experience across the Department will help me contribute to overcoming the challenges we all face as we implement the SDSR, building a coherent defence capability and a sustainable defence programme. I look forward to talking to as many of you as possible about how best to achieve these goals in the coming months”. Jon Day takes up the post as 2nd PUS on 10 January 2011.